^ McDougall, Walter A. (Winter 2010). "Shooting The Moon". American Heritage. 59 (4). Retrieved January 3, 2019. ^ "Reds Say Sputnik's Batteries Worn Out". Argus-Leader. Sioux Falls, South Dakota. Associated Press. October 26, 1957. p. 1 – via Newspapers.com. ^ "Reaction to the Soviet Satellite: A Preliminary Evaluation" (PDF). White House Office of the Staff Research Group. October 16, 1957. Box 35, Special Projects: Sputnik, Missiles and Related Matters; NAID #12082706. Archived (PDF) from the original on 24 December 2016. Retrieved 28 April 2015 – via The Eisenhower Presidential Library. ^ Abramson, Larry (September 30, 2007). 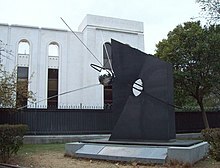 "Sputnik Left Legacy for U.S. Science Education". NPR. Retrieved February 3, 2019. ^ Steinmetz, Sol (2001-07-02). Yiddish & English: The Story of Yiddish in America. University of Alabama Press. p. 65. ISBN 9780817311032. ^ "Replica Sputnik I satellite". Science Museum Group. Retrieved February 3, 2019. ^ "Replica of the Sputnik-1 Satellite". Museum of Applied Arts and Sciences. Retrieved February 3, 2019. ^ "Inaugurada en Madrid una escultura en homenaje al primer spútnik" [A sculpture is Inaugurated in Madrid in homage to the first Spútnik]. 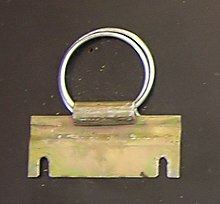 Sputnik (in Spanish). June 12, 2008. Retrieved February 3, 2019. ^ Stradling, Richard (November 17, 1997). "Russians Launch Sputnik replica, Trigger Memories of First Satellite". Daily Record. Morristown, New Jersey. p. 6 – via Newspapers.com.